The wallet contains a Bot Store under the Chat tab. Inside the Bot Store are Chatbots. You can PAIR your platform with another platform on a separate device, via the Chat tab. If both devices are present, this is useful for practising with textcoins and smart contracts. 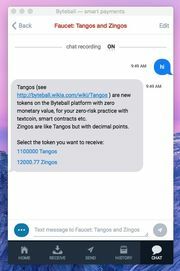 It also works when the other device is remote, enabling end-to-end-encrypted chat with strangers online, as well as sending private payments and using smart contracts with them. You can also pair your device with a bot, which emulates the experience of chatting with a live person. The bot will have very limited responses, but enough to get the job done. A merchant bot could allow you to select from a range of pizzas, for example, then pay for your order with two clicks while still in that chat session. These bots are the applications on the Obyte platform. A project to translate these bots started in March 2018. The All translations page tracks which languages have been completed for which bots. ^ Ideally, crypto transactions are trustless, in that neither the sender nor the receiver need trust the other. The more trustful the situation is, the less ideal. With the help of this specialized chatbot it is possible to develop one's new bot in any programming language. See the Obyte-to-TCP Proxy article section. Bot links are not needed in this article. Access them via the Bot Store in your platform/wallet Chat. This bot helps to buy Bytes with Visa or Mastercard. The payments are processed by Indacoin. Part of the fees paid is offset by the reward you receive from the undistributed funds. Note that you must be attested first, using the Real name attestation bot. Update 9 July 2018: "Buy Bytes with Visa or Mastercard" is now updated and allows to buy Bytes even without real name attestation. However, in this case there is no partial reimbursement of the (rather high) fees, and Indacoin will perform its own verification. This update is useful for users who don't have Bytes even to pay for the attestation or just don't want their real name to be attested. Donate your device’s spare computing power to help scientists solve the world’s biggest problems in health and sustainability, and earn some Bytes in the meantime. This bot allows you to link your Obyte address and WCG account in order to receive daily rewards for your contribution to WCG computations. Buy a username and receive money to your @username instead of a less user-friendly cryptocurrency address. Proceeds from the sale of usernames go the Obyte community fund and help fund the development and promotion of the platform. Get a chance to win a weekly prize just by linking your existing balance. The greater is your balance, the greater is your chance to win. No payment is required. The prizes are paid from the undistributed funds. If you refer new users to the draw and one of them wins, you also win. Verify your email address, and your payers don't need to know your Obyte address any longer: they just write your email address as recipient. Note that sending funds to your email address only works with a public attestation in the bot, not a private one. See the Attestation article for detailed instructions for people new to Obyte. After the first successful verification, you are rewarded with $10.00 worth of Bytes from the distribution fund if your email is on one of the whitelisted domains (@harvard.edu and @eesti.ee). Exchange Obyte-issued tokens against Bytes or token vs token. The exchange is based on smart contracts, so you don't have to trust the exchange operator. This is intended for proper ICOs, not for some casual token you just created. After opening the bot, type "pairs" to see what is available. If you are an accredited investor, have your accredited status verified by a licensed attorney and get access to ICOs that sell security tokens to accredited investors only. Actual verification is outsourced to verifyinvestor.com which already provided this service to a number of ICOs. A licensed attorney checks the submitted documents and confirms the accredited status, then our bot (which is also a witness) posts the attestation record to the DAG. With this record, the issuers can easily see that an investor is accredited, therefore allowed to buy securities. Verify your Steem username, and your payers don't need to know your Obyte address any longer: they just write steem/username as recipient. After first successful verification you get a reward in Bytes, the amount depending on your Steem reputation. Other apps offer discounts or bonuses to users with high reputation. These apps include: ICOs, Real name attestation bot, Buy Bytes with Visa or Mastercard bot. Also see the wiki Attestation article. If you have a question regarding steem attestations please submit the details through this Google Form. The sports oracle posts a DATAFEED line only for those fixtures requested by users through the chat. See the wiki article Sports betting for details. Combining the elements of provably fair online gambling and role-playing games, Slice&Dice Dungeon delivers a unique gaming experience for everyone. The player takes a role of a dungeon inhabitant who has come across a violent underground casino. The main goal in this game is to become a powerful and respected member of the community. Doing so requires one to gamble on the Obyte tokens and to get into fights with other players as part of the endless struggle for power. There's an extensive wiki article about sports betting and this bot. This bot gives out free Tangos, Tingos, Zangos, Zingos and Credits. These fun-coins have zero monetary value so you can practise textcoins and smart contracts with zero risk. Worldopoly is the world’s first mobile game combining AR (Augmented Reality), AI (Artificial Intelligence), Geolocationing, Blockchain, and DAG. The ICO is active until 17 May 2018, and you can buy WPT tokens with Bytes, BTC, or Ether. WPT token is issued both on Obyte and Ethereum platforms but investors on Obyte platform receive increased bonus (even if they pay in ETH or BTC) for investments up to 30 ETH. This is for the Chinese market. Project website: http://123cb.net, in Chinese only. For tokens issued both on Obyte and Ethereum platforms, the bot enables seamless exchange between Obyte and Ethereum tokens. This chatbot allows several persons to chat together using the Obyte messaging system. The bot decrypts messages and relays them to other users after re-encryption. For best privacy, run your own instance of this bot using the source code below; any cheap Virtual Private Server is enough to host it. Aworker is a decentralized next-generation recruitment platform. Aworker reinvents Human Resources processes via referrals and smart contracts. The search for employees powered by smart contracts reduces “cost per hire” up to 4 times. Nousplatform is a decentralized next-gen investment ecosystem. Nousplatform is set to disrupt the traditional AuM market with the introduction of smart contracts and blockchain technology. The platform empowers everyone with simple and efficient access to the investment world. Discounts apply for Obyte and Steem users. Whitelittle is a chat room (in Chinese) for newcomers who want to enter the blockchain industry. The purpose is to build an information discovery ecological platform that provides effective help for newcomers based on the Obyte technology. Here you can chat and help others without being censored and get some rewards. A very simple, and provably fair, dice game. Clearcost.Club books accommodations in hotels worldwide cheaper than the lowest market price by 5% to 15% and more. ClearCost = Cost price + membership fee. The membership fee in CCWT tokens is about four times less than in USD, and this ratio will grow. CCWT are unique tokens with the economic justification for the price. Our ITO is active until October 31, 2018.